Cristóbal de Morales enjoyed great esteem in the sixteenth and eighteenth centuries among Spanish and European musicians, as is apparent from the many editions and manuscript copies of his works that proliferated in churches and cathedrals. But there are many of Morales’ master works that the editor Monsignor Angles could not recover before his death. 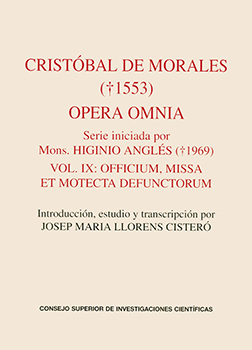 The discovery of ms. 21 in the archive of the Cathedral of Valladolid has allowed publication of this volume, number IX, and continuation of the publication of Morales’ Opera Omnia. Specifically, this volume presents the “Office for the Dead” complete, containing the “Officium”, a polyphony for Matins, the “Missa pro defunctis” and “Motecta”, enriched with a number of important parts that question usual structure of the mass.